Even when your applications are running well and your monitoring systems all show green, there are still opportunities to improve the performance of your database. Proactive optimization can help your team prevent fire drills. SQL query optimization is an effective approach to proactively accelerate database performance and reduce the bottlenecks slowing your applications. Database Performance Analyzer continuously analyzes application performance and pinpoints SQL statements that can be optimized, which helps you to reduce bottlenecks and improve efficiency. This can result in considerable cost savings, as well as cut back on performance problems and downtime. SQL query optimization helps developers achieve recognizable performance improvements. Optimizing bad or expensive queries can require performance metrics like execution, query duration, CPU time, logical and physical reads, and more. Gathering information, establishing baselines, and maintaining histories are all critical for effective SQL query optimization. These are often time-consuming processes that can easily be overlooked for more urgent tasks. However, optimizing queries without this data can lead to expensive and unnecessary hardware upgrades. SolarWinds® Database Performance Analyzer (DPA) provides you with the fastest way to analyze SQL statements, identify the root cause of performance problems, show trends, and establish baselines for key performance metrics. 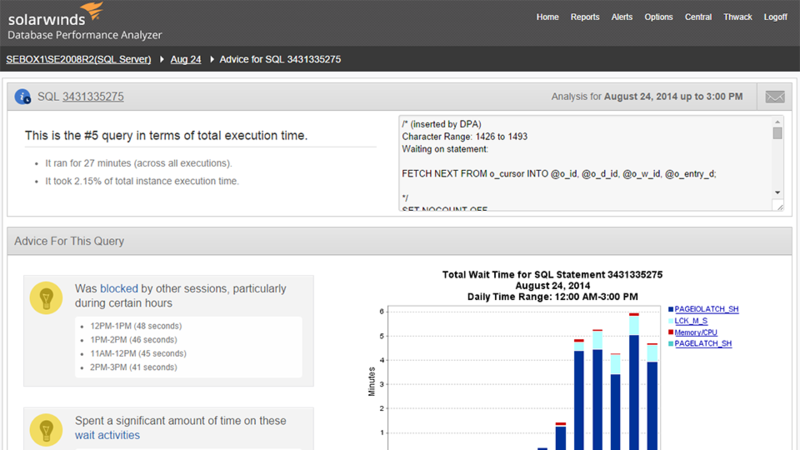 Identify which SQL query to focus on using response time analysis. Quickly see what the problem is and how to fix it. DPA collates the data of all SQL statements every second and helps rank them based on response time. This helps developers and DBAs identify which SQL query to focus on. Response time analysis helps identify bottlenecks, pinpoint root causes, and prioritize your actions based on the impact that poor database performance has on end-users. Safely monitor SQL code performance even in production. Using the DPA dashboard, developers can drill down into a production database to learn how a code is performing. Be more precise with your hardware recommendations. Analyze and optimize existing hardware resources before investing in costly upgrades. SolarWinds DPA helps align resource provisioning with database performance, which gives admins the kind of information they need to be more definitive about hardware recommendations. DPA helps you clearly see (even down to the physical host layer) how hardware is impacting performance. Monitor and optimize the top RDBMS engines on-premises, virtualized, or in the cloud. Get a unified view of database performance. Get all the information in easy-to-understand bar charts. Quickly access historical performance trend information. DPA presents all of the information about the key performance indicators in easy-to-understand bar charts with alarms that lead to more detailed data surrounding an issue. Having easy access to this information enables DBAs and the whole application team to reduce downtime, effectively optimize resources, and quickly identify which SQL query to focus on. Collect execution plans in real-time. Easily revisit plans when needed. DPA collects execution plans in real-time and links them with the SQL statements, wait types, and other performance data. The plan is displayed graphically with pop-up dialogs when scrolling over specific steps in the plan. DPA also stores this data so you can revisit the plan when needed to find exactly which execution plan was used. Tuning advisors provide clear and actionable advice. Get detailed, expert tuning advice. DPA collates data points from five years to five seconds ago, and presents the results in easy-to-understand bar charts with alarms that lead to more detailed data surrounding an issue. Tuning advisors point DBAs toward problems that need immediate focus and provide clear, actionable advice.